Sean Carney, an artist in Lawrenceville, NJ recently posted his painting “Homage to Michael Graves” to MGA&D’s Facebook page. At first glance, it appears to be done with acrylics and oils, but upon closer inspection, it is done on wood using a dremel to carve the surface, using the wood grain and gashing into the wood to create highlights. 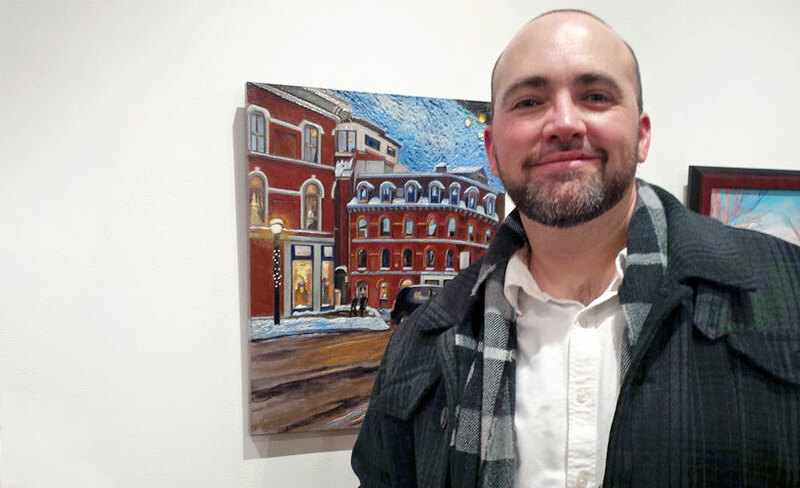 We reached out to Sean to ask why he selected the Princeton Arts Council Building as the subject of his painting and to learn more about his unique painting style. My Name is Sean Carney, I am a fine artist, a high school painting teacher at Lawrence High School and a doorman at Triumph Brewery in Princeton. Why did you select the Princeton Arts Council Building to paint? There is an exhibit that I am applying for that asks you to choose an artist as your mentor and I decided to choose an architect as opposed to another painter. I knew that Michael Graves was a very well known local architect who was also an artist and championed the use of artwork in architecture, so the choice was easy. I also wanted to emphasize the architect/artist connection so I decided on the Princeton Arts Council Building. I have spent a lot of time in the building and drive by it all the time on my way to work on Saturdays. I paint with water based wood stain and I use a dremel to carve out the light. I don’t believe that any other artist is doing what I am doing. My process is pretty unique and I am very proud of that, it did not just come together over night it is something that I have been working on for some time now. It is just something that I have always done. My mother sent me for private lessons, and I attended the School of Visual Arts in NYC for high school and received my BFA from New Jersey City University. What do you like about architecture that makes you want to paint it? Honestly at first it was about places I love, the buildings where just a place marker for memories with loved ones. I love going to Boston and Toronto and Princeton and while I am there enjoying myself I take my surroundings in and imagine painting them. The paintings of places are my connections to people. Everything and nothing I am always inspired. One of my favorite artists, Chuck Close, has a pretty famous quote where he says “Inspiration is for amateurs. The rest of us just show up and get to work.” That is exactly what I do, I just paint. Every day. How do you think/want other people to respond to your art? I want work to be relaxing, pleasing and thought provoking, like a great meal or a great song. I want people to recognize not only my creativity but my craftsmanship as well. What’s your favorite piece of artwork? I don’t really have a favorite, there is always this love hate relationship going on. I can tell you that every time I sit down to start a painting I am confident that I am going to fail miserably and every time I start to turn that corner and realize I am going to create a solid painting I fall in love with it.